This album largely existed to serve as a "soundtrack" for the film of the same name. It was expanded to include both some new non soundtrack songs and a couple of cover versions thrown in for good measure. After the diversification of the end of the previous year's "Beatles For Sale", where John Lennon's questioning, often cynical approach to relationships was given free reign there would have seemed to have been a conscious effort to "lighten things up" a little, mainly to suit the happy-go-lucky ambience of the film. The country rock vibes that were very present on "Beatles For Sale" are still there. Indeed, it would take until 1966's "Revolver" to see the demise of those completely. 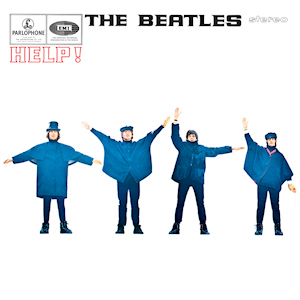 The lead off huge hit, in the title track, is a great start, Lennon laying himself bare, but in a very singalong, impossibly catchy way, so much so that any real cry for help is lost beneath the appeal of the upbeat tune. Lennon later claimed, expressing personal regret, that the song was changed due to "commercial pressure" from a morose piano ballad to the "fun" song that suited the film. "The Night Before" is a mid-paced country based rocker with a throaty McCartney vocal, all very nice and steady with good sounding percussion and some nice guitar right at the end. The old "Dylan influence" chestnut rears its head again in Lennon's sensitive "You've Got To Hide Your Love Away". Some acoustic guitars, lyrical sharpness and a starkness of delivery do not a Dylan make. Dylan, as it happens, was, around this time, recording his electric stream of consciousness in "Subterranean Homesick Blues" while The Beatles were going all acoustic in the manner of Dylan's earlier albums, (supposedly). Harrison's "I Need You" was an appealing, but by now characteristically downbeat tune, almost laconic in its vocal delivery. It contains an intriguing guitar sound just behind the vocal refrain. "You're Going To Lose That Girl" is a very 1950s rock n roll type ballad featuring Lennon's melodic yet at times vituperative vocal. Ringo Star''s madcap bongos on this track are utterly incongruous and irritating. The jangly, instantly recognisable strains of the marvellous hit single "Ticket To Ride" need no introduction. It has been said by several writers over the years that this was recorded around the time The Beatles first dabbled in LSD. If true, the drug did a good job. The song is perfectly created and performed, possibly the high point of their career so far. The guitar sound on here would continue with successful songs like "Nowhere Man" and "Paperback Writer". The rockabilly style cover of "Act Naturally", an old country and western hit, suited Ringo Starr's deadpan vocal delivery and his ordinary but loveable persona perfectly, particularly as shown in the films. Indeed, it almost could have been written for him (obviously it was not). "It's Only Love" was lyrically shallow but melodically catchy, Lennon apparently hated it. Harrison's "You Like Me Too Much" sounds like something from the "She Loves You" days. Very early 60s pop, innocent and twee but featuring a nice piano break. "Tell Me What You See" is another disposable, early 60s style pop number featuring McCartney on vocal. 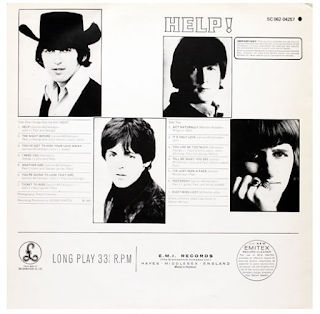 McCartney had not really contributed much to "Help!". It had largely been Lennon and, to a lesser extent, Harrison. The country-ish, jolly, folky romp that was "I've Just Seen A Face" betrayed a few "problems in love" lyrics, but it was not a very convincing attempt to get back "with the project", to be honest. Then, of course, however, there is McCartney's seismic redemption with his solo recording (with orchestration) of the most covered song in history - "Yesterday". It featured classical music instrumentation for the first real time, something that would be utilised considerably by George Martin and McCartney on songs like "Eleanor Rigby" and "She's Leaving Home". The album ends of a lazy, irrelevant low point in a muffled cover of Larry Williams' "Dizzy Miss Lizzy" which seems to suffer from awful sound problems. No need for this to have featured at all. It would be their last cover version.